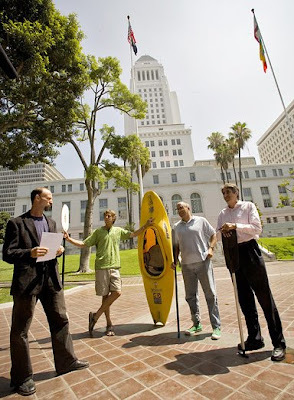 A contingent of kayakers, the LA River Expedition kayak team, will set upon the headwaters of the LA River this Friday at the overpass at Owensmouth (Canoga Park) and paddle to the sea (Long Beach). The 52 mile kayak trip will take two days to complete and will be done in fresh water kayaks made by Pyranha. The objectives of the expedition are to raise consciousness about the LA River and to prove to the Army Corps of Engineers that the river is fully navigable by boat. The Army Corps of Engineers states the river is not-navigable, and no boats are allowed on the river. Hope they make Lewis and Clark proud.